Goldie's Place patient receives dental care in the new dental facility. A generous grant from the Washington Square Health Foundation is providing Goldie’s Place with critical equipment for a modern four-chair dental clinic serving Chicago’s homeless and economically disadvantaged. The grant will help underwrite the high cost of a digital x-ray machine and an autoclave sterilizer. Opening of the expanded dental clinic at 5705 North Lincoln Avenue in May 2008 represents the culmination of a program enhancement effort that began two years ago. The Washington Square Health Foundation grant is an essential component of the overall plan to increase the number of homeless patient visits by 55% by the end of 2008 as part of a gradual expansion to 800 patient visits annually by the end of 2010, representing nearly a four-fold increase in capacity. The new clinic is also the catalyst for an emerging partnership between Goldie’s Place and the College of Dentistry at the University of Illinois at Chicago that will establish a first ever student-run dental clinic operating in tandem with the Goldie’s Place Volunteer Dental Care Program. The Goldie’s Place Volunteer Dental Care Program has provided exams, cleanings and treatment to over 1,100 homeless persons since its inception in 1997. The experience of the last eleven years demonstrates that dental care can make a significant difference in general health along with a major improvement in self-esteem and the ability of a homeless person to connect with a job. Dental care is a crucial component of the transformational experience that Goldie’s Place seeks to make in the lives of the homeless. Programming at Goldie’s Place focuses on a two-pronged effort to help the homeless move toward stability and a better life. Through the Employment Assistance Program, homeless people find jobs through personal coaching, instruction, and job development. The Supportive Services Program focuses on assistance that enhances a presentable appearance and increased confidence: no-cost dental care and a clothing closet stocked with lightly used business and on-the job clothing. These services are essential to the Goldie’s Place core mission of self-sufficiency through employment because they enhance the self-esteem and assurance necessary to successfully approach hiring companies. The Washington Square Health Foundation has been a long-term partner with Goldie’s Place. 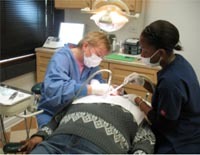 In 2002, the Foundation supported the transition from a “M.A.S.H” type portable dental facility with one volunteer staff dentist to an improved dental facility with two permanent, plumbed dental operatories. With this help, Goldie’s Place recruited additional volunteer dentists for the program, and established a partnership with Heartland Health Outreach / Spang Center for Oral Health. Now, after several years of successful program delivery, the Washington Square Health Foundation is supporting the next stage of growth at Goldie’s Place. With a new and larger space and an expansion from a two-chair to a four-chair dental facility with independent access from the rest of the office, Goldie’s Place will have the potential for a six-day per week clinic operation with evening hours. This arrangement will also enhance the privacy and dignity of client services. The program will not only accommodate a larger number of patients but also a much broader opportunity for participation by volunteer dentists. This clinic represents a major addition to current services.